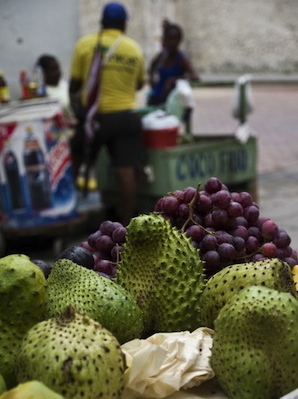 A typical Cartagena lunch. All photos by Drew Alexander. Given her deathly allergy to shellfish, you might expect Sally Spaulding to skip Colombian fare and stick to the safe stuff. But she was inspired to find the best eats in Cartagena. After all, it was a life and death situation. When you’re deathly allergic to shellfish and traveling to Colombia where limited English is spoken, practicing phrases like the above, as well as “I could die if I eat that” (with the appropriate pantomimes of course), is a good use of time while planning a trip. It’s also the perfect excuse to pore over restaurant information and menus — which just so happens to be my favorite part of pre-trip dreaming. On a recent trip to Cartagena, I was happy to take on the task of planning the eating and drinking agenda for our group, claiming my shellfish allergy as an excuse for the job. After all, it is a life and death situation deciding where and what to eat. As soon as we were settled in our apartment within the historic walled city, we were ready for a drink. Cartagena is a beautiful city with interesting architecture at every turn, and there’s no better place to get a sense of the area than . Located on the city wall itself, you can take in views of the old town, the gleaming condominiums of nearby Bocagrande and the sea, while enjoying an extensive drink menu offering everything from martinis to cold glasses of Aguila (Colombian beer). Sufficiently cooled from the ocean breeze and a round of mojitos, we set to wandering to our next destination, a restaurant I was very excited about based on recommendations from a chef/friend. was to be THE place to try authentic Colombian fare in a chic but relaxed atmosphere. Thanks to a website with menus, I’d already picked out what I wanted to order. Unfortunately, what was not posted on the site (or perhaps what my Spanish skills failed to decipher) was that the restaurant was closed for renovations. 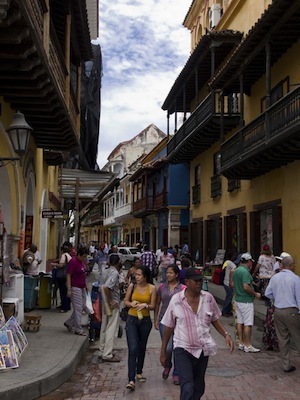 Luckily, Cartagena seems built for aimless meandering. Our group explored the plazas in search of a fitting dinner substitute, pausing as many a horse and carriage clip-clopped by on the quiet streets. Cartagena by day is all bustle, people and activity, but at night, taxis disappear, replaced by strolling couples, carriages, and a subdued, romantic atmosphere. We found ourselves at Peru Mar (Calle Santo Domingo 33-41; +57-05-6649771) near Plaza Santa Domingo, a quiet spot serving Peruvian fare. Many locals we spoke to especially recommended their ceviche. Reasonably priced and perhaps a bit fancier than we expected, the food was excellent. My octopus carpaccio arrived with fat but deadly shrimp on the side — a thoughtful and lovely garnish for anyone but me. Once remedied, the dish was superb and topped with a surprising black olive cream sauce. We weren’t missing 8-18 in the least. 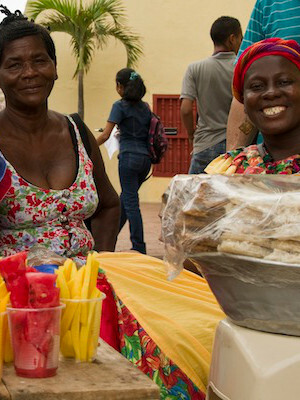 Lunch is the primary meal in Colombia, so there are many choices in Cartagena. , known as “the German place” thanks to its house-made sausages, has no formal menu — just a large chalkboard on the wall with the day’s specialties. There is a nice mix of tourists, ex-pats, and locals, and while the ambience is lacking (along with air conditioning), the portions are large and come with extras like house-made chicken soup. 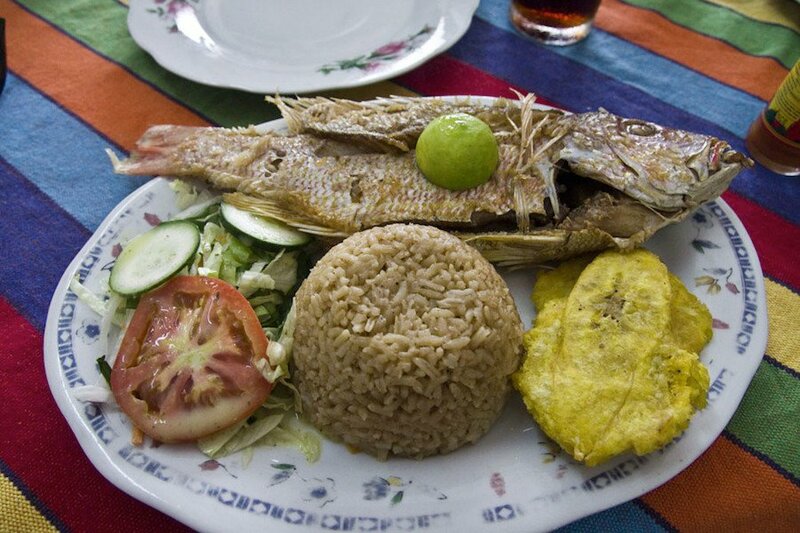 A typical Cartagena lunch includes a fried whole fish, coconut rice, a lettuce/tomato/onion/avocado salad and fried plantains. Expect to pay about $10 U.S. for this type of feast in any number of the city’s restaurants. My husband and I ventured outside the walled city to check out for lunch, a perfect spot to dine when walking to or from the Castillo San Felipe de Barajas — the greatest and strongest fortress ever built by Spaniards and an important part in the history of both Colombia and South America as a whole. Nestled in the Gethsemane area, which is a bit grittier than the old town district, the restaurant is definitely a local favorite: We were the only gringos in sight. We started with two large coconut lemonades — a frothy concoction that could make you swear rum was in there somewhere. It was just that good. The restaurant is known for its seafood stews, and the portions are large. We also shared an appetizer of shark cooked in an almost Thai, larb-like fashion and served with golden fried plantains. Happy hour is embraced by some restaurants in the city, with many offering specials and discounts from 4-7 p.m. One gem we discovered was overlooking busy Plaza San Diego. The restaurant is operated by a Cartagena native and his British partner, and it’s an affordable place for a meal and upscale drinks. Perhaps more interesting than the Thai green curry on the menu are the restaurant’s boat trips to islands off the coast of Cartagena. The trips include fabulous lunches, drinks, and a yacht, and are reasonably priced. Tourists without fluency in Spanish will be able to arrange the trip with ease. On our final night in Cartagena, we wanted to experience a bit of nightlife. A friend who loves jazz and had traveled to Cartagena on a music mission said that La Vitrola (Centro Cll 33 #2-01 Calle Baloco; +57-05-6600711) had a fantastic Cuban band nightly, so we made reservations on a Friday night — early, since that was all that was available. We arrived to find a stern manager with a guest list. My brother-in-law had failed to pack pants for the trip and was wearing a nice shirt and smart shoes with khaki shorts. He was turned away with a huff. Knowing he would be just as happy with arepas (tasty fried flatbread filled with cheese) from a street vendor, we kept our reservation and ventured inside minus one. The wine list was surprisingly good, considering the limited selection we had encountered at other restaurants in town. But the food was underwhelming: a variety of seafood pasta dishes that were bland and uninteresting. The music was lovely and the service was attentive if a bit snobbish, considering the incident with the shorts. We finished our meal and headed out to the streets, where vendors pushed carts of fruit, makeshift coffee stalls popped up on corners, the scent of grilled meat filling the evening air. У нашей организации интересный портал на тематику make-up.kiev.ua. Sally is a public relations professional who has lived in the Aspen area for seven years. She travels for the views.